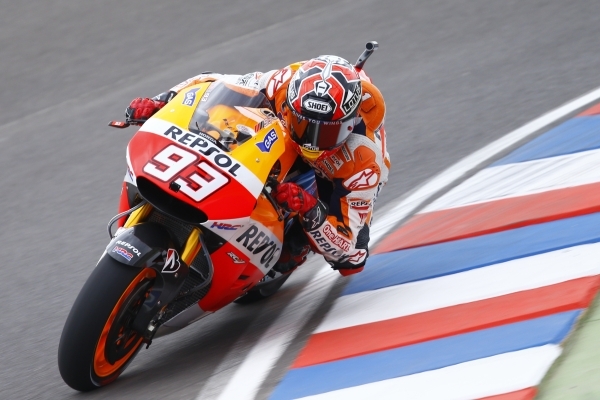 Marc Marquez is defending his World Title in style as he set a new record in the history books with his third consecutive win at the Grand Prix Red Bull de la Republica Argentina. He is the first rider to win the opening three rounds of a season from the pole position since Giacomo Agostini in 1971. Marquez didn't have the best of starts and was fifth at Turn 1. This group was tightly packed with Lorenzo leading the pack and Andre Iannone, Pedrosa, Rossi, Marquez, Dovizioso and Bradle all riding closely. This resulted in exciting early few laps as riders ran wide and switched positions. For Alvaro Baustista of GO & FUN Gresini Honda and lodaRacing Project's Danilo Petrucci, the race ended early as they both crashed out in the first lap. At the front, Marquez was pushed back to seventh in the early huddle and waited patiently before eventually making some safe passes and arriving at second behind Lorenzo. From then on, Marquez followed Lorenzo consistently reducing the gap. With nine laps to go, Marquez bested Lorenzo with a safe pass at Turn 1 at the end of the main straight and remained unchallenged till the finish. All this time, Dani Pedrosa managed to arrive at third and rode comfortably for laps before making a late charge on Lorenzo. Pedrosa overtook Lorenzo on the penultimate lap and posted the fastest lap of the race on lap 22 of 25. Lorenzo eventually finished third which has been his best result of the season so far. As Lorenzo said post race, “this was probably the most sweet third place in my career in MotoGp, arriving after two difficult races”. Lorenzo's teammate Valentino Rossi looked like he had the pace to fight at the front; however, he ran wide couple of times in the early part of the race losing positions to seventh. Rossi battled with Dovizioso, Bradle and Iannone to eventually finish at fourth. The Italian looked disappointed on arriving in the pit after the race as he clearly looked fast enough to finish on the podium had he not lost positions due to running wide. Marc Marquez is leading the 2014 championship with 75 points while Dani Pedrosa and Valentino Rossi are second and third with 56 and 41 points respectively.